How Much Earthquake Resistance does your House already have? Before doing any retrofit work the existing earthquake resistance of each house must be evaluated to see how many foundation bolts, shear walls, and other earthquake resisting components will be required. House on flat lots, irrespective of whether or not they are bolted normally need this kind of retrofit. This is a common retrofit for tract homes such as found in San Jose, Santa Clara, and surrounding areas. Can my House Survive a big Earthquake without a Retrofit? Many older homes were built without any code at all and it is anybody’s guess how well it was built to resist earthquakes. In 1927 San Jose became the first Bay Area City to adopt the Uniform Building Code, Fremont adopted it in December of 1956, other cities adopted this code at random times until its adoption became California Wide in 1958. The 1927 went through 22 renditions up to the adoption of the current 2016 International Building Code. These codes are invaluable because they give us an historical record of how much earthquake resistance we can expect an older house to have. In any retrofit design we factor in the provisions of the earlier codes before augmenting its current resistance to achieve a desired level of resistance. Houses built on hillsides, many of which are in San Francisco, and the Berkeley and Oakland hills, are especially vulnerable to earthquakes even if they stringently followed the California Building Code. This code does not recognize the unique weaknesses of hillside homes. This table is a synopis of material found in old building codes and tells us how strong a house already is. This is extremely helpful when determining what a house must need now. Plywood is not the only material that resists earthquakes. Table A4-A tells how strong shear walls are when made out of sheet rock, plaster, and boards placed horizontally or at an angle on wall framing. 99% of the old pre-1958 houses in Oakland, Berkeley, and San Francisco needs a retrofit, and understanding how these building materials contribute to this is important. 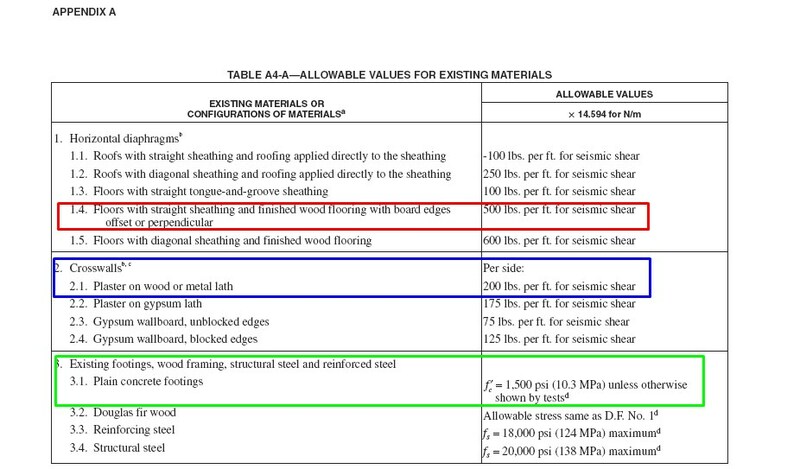 In item 1.3 we see that “floors with straight tongue and groove sheathing” are rated as having an “Allowable Value” of “100 lbs per ft. for seismic shear.” This tells us every linear foot of straight wood horizontal diaphragm (floor) can resist 100 pounds per linear foot. Item 2.1 tells us how much earthquake force “crosswalls” have. These are the materials you will find inside the honeycomb of walls throughout the living area. These walls are quite strong and are the reason you do not see significant failures inside the living area. If we stand it up and make it will still only be able to resist 100 pounds per linear foot which is very weak. This is exactly what horizontal exterior siding is and why retrofits are of homes with horizontal exterior siding are so necessary. At the top of the table you will see the term “Horizontal Diaphragms”. Horizontal diaphragm is a fancy term for a floor. Old floors are made of boards, and these boards, whether placed horizontally or at an angle, are called “wood sheathing” and have a certain amount of earthquake resistance. This table tells us the strength of the floor in terms of its internal strength and the strength of the floor to the floor joists connection. Section 1.4 tells us floors made of boards installed at an angle can resist 500 pounds per linear foot. Section 1.5 tells us floors can resist 600 pounds per linear foot if these floors are also covered with oak flooring, which is the most common configuration in Bay Area homes. A resistance of 500 or 600 pounds per linear foot is comparable to well nailed plywood. In other words, the floor will act like one giant and very well built piece of well nailed piece of plywood. Some engineers, who have not read this part of the building code, insist of putting plywood on the joists on the underside of the joists. They believe the floor may not have enough strength as is. Some insist on strengthening the sub-floor to joist connections with metal for the same reason. If one uses the building code rather than pure speculation, spending money on these techniques is a complete waste. More importantly, there is no empirical evidence from previous earthquakes that floors become separated from floor joists or otherwise fail. I mean NO EVIDENCE. If you find a photo or report that contradicts this I would like to see it so I can post it on this website. In summary, it is always best to refer to science and published and vetted building codes rather than conjecture and guessing. Item 3.1 highlighted in green tells us existing foundations, which are almost always quite shallow, can be assumed to be 1500 psi (this means it can resist 1500 pounds per square inch of pressure and is considered quite poor in quality). Tests performed by the Structural Engineers’ Association of Southern of California (SEAOSC) determined that 1500 psi concrete performed quite well in terms of earthquake resistance. In other words, poor quality concrete with shallow footings are not a serious issue. If the foundation is holding the house off the ground, it is doing what it is supposed to do. This fact, coupled with the information in table A4-A from the California Existing Building Code and the conclusion of the SEAOSC tests mean foundation work is rarely warranted. Homes braced with horizontal boards can only resist 100 pounds per linear foot, which is not much and is why we retrofit houses. It is also true that once these boards fail, the boards splinter and become worthless. If the house has stucco, underneath the stucco you will find horizontal boards that will collapse once the very brittle stucco fails. This is why houses with stucco also need to be retrofitted. Houses with stucco or wood siding can be found all over the San Francisco Bay Area. For example, imagine the front and back of a house are 24 feet long. If they have horizontal sheathing, also called horizontal siding, the cripple walls will be able to resist 2400 pounds of earthquake force before they fail and become useless. If we add 12 linear feet of plywood sheathing designed to resist 870 pounds per linear foot, the front and back of the house can resist an additional 10,440 pounds of earthquake force before reaching a failure point. Plywood does not splinter, so even after the plywood “fails” it keeps “working” for the duration of the earthquake and will save the house. Diagonal sheathing means the boards are installed at a 45-degree angle. This table tells us it can resist 600 pounds per linear foot, a lot of capacity. If we find homes with diagonal sheathing on the walls we tell customers to put in some bolts and then forget about it. Look at how little damage this house sustained even though it collapsed off its foundation; not even the windows are broken. Many houses look like this. This is because a house is a cube (floor, walls, and roof) in which there are smaller cubes in the form of bedrooms, hallways, bathrooms, etc. Cubes are a very strong geometric shape and can keep a house more or less intact. The small cubes inside the house contain what are called cross walls. As shown in the table above, cross walls made of plaster can resist 200 pounds of earthquake force per linear foot, which is quite a bit. The earthquake resistance of drywall is also high. This is why old houses in Oakland and Berkeley sustained so little damage if they remained on their foundations. Modern houses such as the ones you see in San Jose and other parts of the South Bay have cross walls covered with earthquake resistant sheet rock, while older houses in San Francisco and Oakland have cross walls made of plaster. Crawl spaces do not form cubes, they have the walls and roof but no floor to connect it all together. This is another reason why cripple walls fail. The high earthquake resistance of plaster and sheet rock explains why houses in San Francisco that fell from their foundations did not implode. An example of this can be seen in the photo to the the left.